In the early 1980's, Golf Digest came up with an idea that would be cause for hilarity for years to come. They wanted to find the world's worst golfer. When Golf Digest closed their entries on April 1, 1985, they had received 627 nominations. And boy, were they awful. One entrant was the only man in Pennsylvania who had ever had a teaching professional refund his money after one lesson. One nominee had a working handicap of 76. Another entrant, a Chief Warrant Officer stationed in Germany, lined up four games with people who had never played before - and lost all four (one of them to the wife of his Sergeant). In the end, Golf Digest chose four lucky contestants that they deemed the worst of the worst and slated them to compete against one another for the title of Worst Avid Golfer. The four competitors were: Angelo Spagnolo, a grocer from Fayette City, PA; Jack Pulford, a restaurant owner from Moline, IL; Joel Mosser, a stockbroker from Aurora, CO; and Kelly Ireland, an attorney from Tyler, TX. 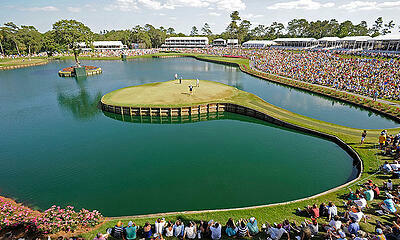 And what better course to play them at than the one that even strikes fear in professionals - TPC Sawgrass! So, the four came out to Ponte Vedra, FL in 1986 for a Thursday practice round and a Friday match (following all PGA rules) filled with TV crews and what some would call "fans" and others would call "sadists". Words cannot accurately describe what went on here. You just absolutely have to see it for yourself. It will be the best 3 minutes and 19 seconds of your day. After seven hours of play, 12 dozen golf balls lost and 25 range balls lost, we had a winner. Yes, folks, Kelly Ireland was the "winner" with an 18-hole score of 197. Angelo Spagnolo, owing to his 66 strokes on the 17th and 27 in the water, finished with an 18-hole score of 257 and the title of Worst Avid Golfer. His son even booed him. Additionally, the path that Mr. Spagnolo took to putt his ball all the way to the tee on 17 is now affectionately called "Angelo's Alley". 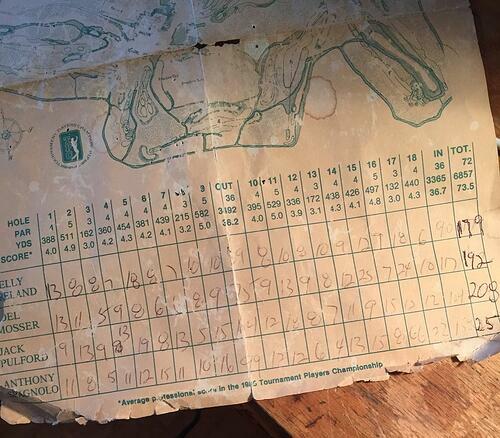 I mean, just look at this scorecard. However, this story does have a happy ending. The Golf Channel invited Angelo Spagnolo to return to TPC Sawgrass in 2011 and see if he could improve his score. The answer: kind of! Click here to watch it - it's almost as good as the first video. He has such a great spirit, it's admirable - at the end of the video, he says, "Well, it still beats going to work, even though I can't play golf". In addition, Angelo and the other three Worst Avid Golfers still meet up on the golf course from time to time to raise money for charity. Angelo has hosted his own golf tournaments and raised more than $1 million to fight Multiple Sclerosis. This is by far my favorite golf story of all time. If you want to read more about the tournament and how it came to be, click here. There's just way too much hilarious stuff to put in a single blog post. The moral of the story: keep a positive attitude and do what makes you happy, even if you stink at it. P.S. : We think these guys would have really benefited from Power Tee, but we'd probably have them sign a waiver or something. 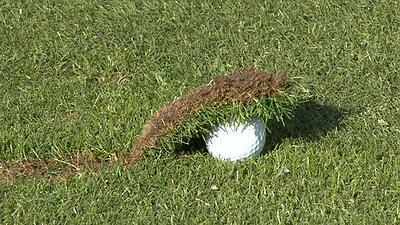 Power Tee is not liable for shots taken that come back and hit you in the face.